Doesn't everybody just love chili? What's not to love? A classic comfort food. 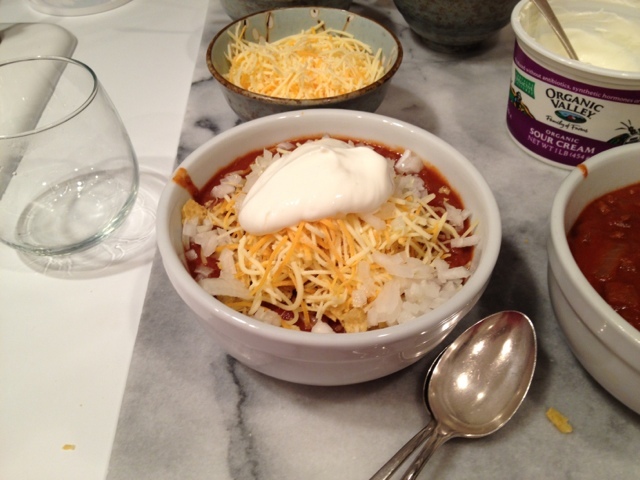 Somebody had mentioned chili just before the Super Bowl, and I had been thinking about it ever since. I love that you can top it almost any way you like (I like cheese, sour cream and onions), and I love that it is super versatile - ground meat, chunks of meat, meat and beans, only beans - however you like. I use a packaged seasoning mix - (Carrol Shelby's Original Texas Brand Chili Kit). I've tried making my own from scratch and I've never come up with a recipe that I like as much as this mix. This makes it a quick and easy weeknight meal, and I'm leaning a lot on easy shortcuts these days. The main part of the kit is just the seasoning packet - certainly something you could mix on your own if you wanted. I dice onions, brown my meat and then stir in the seasoning, a can of water, a can of tomato sauce and a can of diced tomatoes. Usually I will use a chunk of beef, season with salt and pepper and maybe coat with a little flour, cut it into bit sized pieces to brown, and then let the chili simmer for a couple hours until the meat is super tender. But for a quick weeknight meal, this time I just used some ground beef. I think this might actually be the first time I've done it with ground beef and I liked it a lot. I also put in a can of pinto beans - another new twist. I usually am more in the purist camp with chili - I never before have made it with both meat and beans - but this time I wanted more protein without adding more meat, so I went for it. And I liked it. I also just recently made a vegetarian version of this one - I did a three bean chili using a mixture of black, pinto and white kidney (cannellini) beans. It was also very good.